The creative mind behind the signature dishes of Kumo Izakaya is head chef Seung Yeop Ryu. Seung appreciates the philosophy of adhering to the traditions of Japanese cuisine whilst keeping an open mind and view to blending traditional and modern elements. The dishes you will find on our menu are rooted in traditional izakaya fare but with a twist, incorporating elements of South East Asian, Korean and Chinese street food. Rather than having a set of mains, entrees and so forth to choose from, the dishes at Kumo Izakaya are varied by cooking style and designed to be shared with friends and with drinks. Izakaya style is the Japanese equivalent of Spanish tapas. Select from a range of grilled, steamed, vegetarian or rice dishes, have a platter of premium sashimi or enjoy a gourmet dessert. The dishes are sized to snack on or share between two people depending in your choice. Alternatively leave it up to our chefs to guide you on your gastronomic journey with the omakase chef selections, designed for parties of two or more people. Set menus for larger groups are available. At Kumo Izakaya we advocate the mixing and matching of a wide range of beverages to compliment the izakaya-style dishes we have on offer. From sake and shochu to wine and whisky, you will find a different combination of food and drink for each night out. 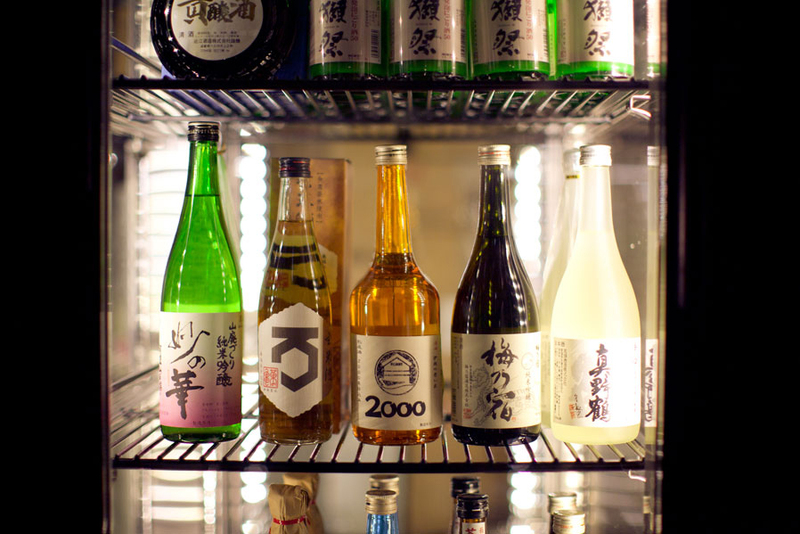 Drinking is after all an integral part of the izakaya dining experience! Choose from over 70 different sake varieties, our concise yet comprehensive wine selection or from our range of house signature cocktails, each based on classic cocktail traditions with an added Japanese twist. Each item on our drink list has been carefully selected by our in-house wine, sake and spirit experts to match our sumptuous food offering. Looking to have some drinks maybe a light snack but not a full meal? 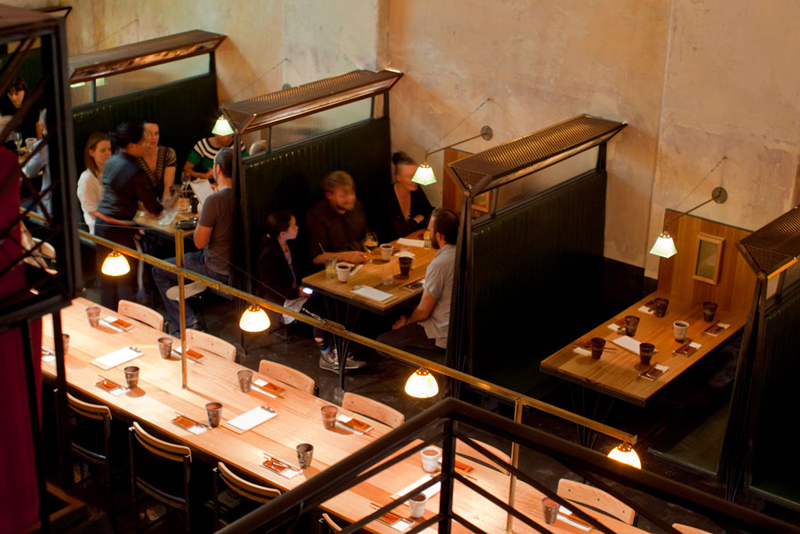 Seats at the bar and mezzanine level are available for those who’d just like to kick back with a drink. Light otsumami dishes are great for a nibble too. Yes! We now do takeaway. Something local residents have been waiting for us to say for some time. 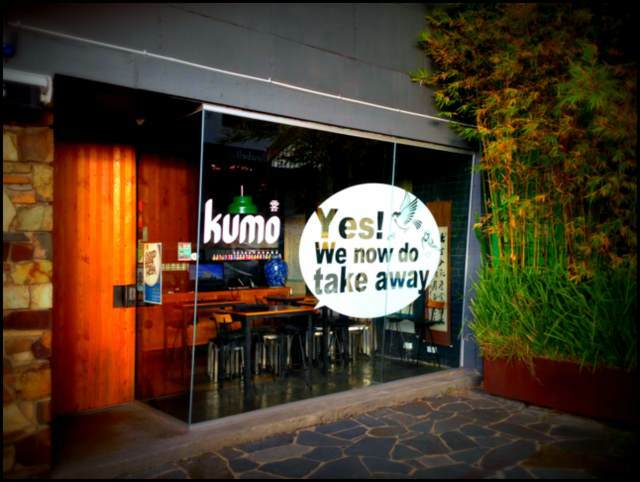 Due to heavy pressure from our wonderful neighbors you can now take Kumo home with you. Perfect for those times when you want to settle in for the night and catch up on the latest Game of Thrones episode (or is it Breaking Bad?) or entertain at your place, the majority of our main menu is available at an attractive take-home price. Order online or give us a call and we’ll start cooking.